1. The Second Vatican Council requires us to reject traditional church architecture and design new churches in a Modernist style. 2. New churches must be designed in accordance with the document Environment and Art in Catholic Worship, published by the Bishop’s Committee on Liturgy in 1977. Due to the lack of any alternative, this pamphlet has become the veritable bible for many new and renovated churches. This document, which was never voted on by the American Bishop’s conference and holds no canonical weight, is based more on the principles of Modernist architecture than on Roman Catholic teaching, or her patrimony of sacred architecture. Among its weaknesses is an overemphasis on a congregational view of the Church, an antagonism towards history and tradition, and a strident iconoclasm. Because of the controversial nature of the document, the Bishop’s Committee on the Liturgy is presently drafting a new and hopefully improved version. 3. It is impossible for us to build beautiful churches today. This is a bit like saying that it is impossible for us to have saints in the modern age. Of course we can and should build beautiful churches again. We live in an age which has sent men to the moon and large sums of money are spent on museums and sports arenas. We should also be able to construct buildings of the quality of the early Christian basilicas or Gothic cathedrals. In recent secular architecture we are witnessing a great revival of traditional architecture, craftsmanship and construction. There are a growing number of young talented architects who are designing buildings in the classical tradition (many of whom would be delighted to design sacred buildings). Students at the University of Notre Dame, who are all trained in the Classical tradition, are in great demand by architecture firms and clients. Also to the point, there are any number of churches which have been built over the past two decades which exemplify the principles of durability, convenience and beauty including: San Juan Capistrano in California, 1989; Brentwood Cathedral in England, 1992; the Benedictine Abbeye Sainte-Madeleine in France, 1989; the Church of the Immaculate Conception in New Jersey, 1996; the Church of Azoia in Portugal, 1995; the Church of St. Mary’s in Texas, 1997; the Church of St. Agnes in New York City, 1997; The Pittsburgh Oratory, 1996, etc. 4. We can’t afford to build beautiful churches today. The Church doesn’t have the money it had in the past. In fact, Roman Catholics are the wealthiest denomination in the country today. We have more CEO’s and civic leaders than any other religious group. We have never been wealthier, yet we have never built such cheap churches. This reflects American giving priorities; from 1968 to 1995 the portion of personal income members gave to the Church dropped 21 percent. The people of God need to be encouraged to generously support the construction of houses of prayer. Bishops and dioceses should be encouraged to promote the highest quality rather than placing a cap on construction costs. The faithful should be willing to spend more on the house of God than on their own houses and build with a quality exceeding other public buildings. One story of great philanthropy concerns Holy Spirit Church in Atlanta which received a generous sum of money from a few of its parishioners enabling them to build a very elegant substantial brick Romanesque church in the early 1990’s. Other parishes, in order to build a worthy and beautiful church, have taken the time to raise substantial budgets or have chosen to build in phases. 5. The money spent on churches is better spent on serving the less fortunate, feeding the hungry and educating the young. If the church were merely a meeting place this view would be legitimate. However, a beautiful church is also a house for the poor, a place of spiritual feeding, and a catechism in stone. The church is a beacon and a city set on a hill. It can evangelize, by expressing the beauty, permanence, and transcendence of Christianity. Most importantly, the church building is an image of our Lord’s body, and in constructing a place of worship we become like the woman anointing Christ’s body with precious ointment. (Mark 14:3-9). 6. The fan shape, in which everyone can see the assembly and be close to the altar, is the most appropriate form for expressing the full, active and conscious participation of the body of Christ. This myth comes out of the extreme view that the assembly is the primary symbol of the church. While the fan shape is a wonderful shape for theater, for lectures, even for representative government, it is not an appropriate shape for the liturgy. Ironically, the reason often stated for using the fan shape is to encourage participation, yet the semicircular shape is derived from a room for entertainment. The fan shape does not derive from the writings of the Second Vatican Council, it derives from the Greek or Roman theater. Up until recently, it was never used as a model for Catholic churches. 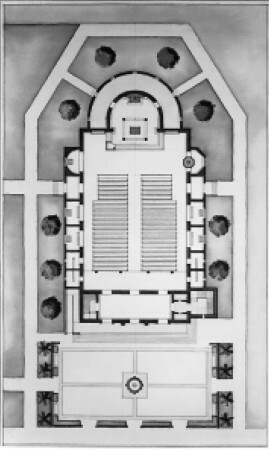 In fact, the first theater churches were 19th century Protestant auditoriums designed so as to focus on the preacher. 7. The church building should be designed with noble simplicity. Devotional chapels and images of saints distract and take away from the liturgy. 8. The Catholic Church should be building the most avant-garde architecture of its day, just as it has throughout history. For fifteen hundred years, and even up until World War II, the Roman Catholic Church was considered the finest patron of art and architecture. The Church formed Christian artists and architects who in turn influenced the architecture of the secular realm. During the last half century, however, the roles have changed, and the Church has been following the lead of the secular culture and architects who have been formed in a non-Catholic world view. 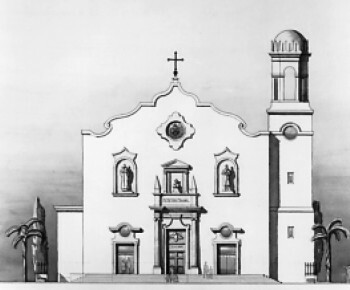 Whereas previously the development of Catholic architecture was inspired by and in continuity with works from the past, the Modernist concept of the “avant-garde” means progress through a continuous breaking with the past. The Church documents ask bishops to encourage and favor truly sacred art and to imbue artists “with the spirit of sacred art and of the sacred liturgy.” The present revival of interest in liturgical architecture by the faithful indicates that Holy Mother Church may regain her rightful place as the preeminent patroness. In this role she has “always claimed the right to pass judgment on the arts, deciding which of the works of artists are in accordance with faith, piety, and the laws religiously handed down, and are to be considered suitable for sacred use.” Also, “bishops should be careful to ensure that works of art which are repugnant to faith, morals, and Christian piety, and which offend true religious sense either by depraved forms or through lack of artistic merit or because of mediocrity or pretense, be removed from the house of God and from other sacred places” (Sacrosanctum Concilium). 9. In the past, people saw the church building as the domus Dei or house of God, today we have gone back to the early Christian view of the church as domus ecclesia or house of people of God. 10. Since God dwells everywhere, He is just as present in the parking lot as in a church. Therefore, church buildings should no longer be seen as sacred places. This is a very attractive contemporary idea which has more to do with pop theology than with Catholic tradition. From the beginning of time, God has chosen to meet His people in sacred places. The “holy ground” of Mount Sinai became translated into the tent in the wilderness and the Temple in Jerusalem. With the advent of Christianity, believers constructed buildings specifically for the divine liturgy which would reflect the heavenly temple, the upper room and these holy places. In Canon Law “the term church signifies a sacred building destined for divine worship to which the faithful have a right of access for divine worship, especially its public exercise.” As “a place set apart” for reception of the sacraments, the church itself becomes sacramental having as its focus the sanctuary, which means a holy place. Just as the ceremonies, elements such as the altar and ambo, and the art are all referred to as “sacred” so are the buildings designed for them. Therefore to seek to remove the distinction of the church as a sacred place for sacred activity is to diminish our reverence of God, which the buildings should help to engender.